Connecticut’s pool demo & removal specialists! The experienced team at Neighborhood Services, LLC has the right equipment and know-how to complete above-ground and inground pool demolition in a cost-effective manner. When you’re ready to get rid of that money pit in your backyard, Neighborhood Services is your local solution! Check out our extensive list of pool removal and demolition projects completed to date. We offer turnkey swimming pool removal service in Hartford, Torrington, Southington, Meriden, Waterbury, Danbury, Fairfield, New Haven, Milford and surrounding cities in Connecticut. We take care of the project from start to finish! Our crew will safely remove the pool, back fill the site, level & grade it. The possibilities are limitless; we have the skills and knowledge to make your backyard dream design a reality! 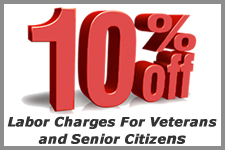 We provide service throughout Connecticut and are proud to provide such a valuable service for our neighbors throughout our service area, often saving them thousands of dollars ($3,000 – $4,000) each year on pool maintenance, utility and repair costs. We understand and abide by local rules and regulations regarding inground pool demo, and we’ll make the process simple for you. We’re a licensed demolition company equipped with excavators, skidsteers, loaders, roll off trucks, and a tremendous amount of support equipment to ensure your pool removal in Hartford CT is done right and in a timely manner. 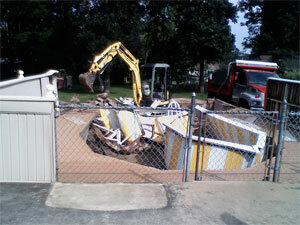 Neighborhood Services, LLC will make quick work of your above-ground pool removal project. We have the right equipment and knowledge of the demolition industry to finish the job promptly and completely. We not only demolish and dispose of the debris, but we can help with siteclearing and grading so it is ready for landscaping. The first step in removing a pool is going to City Hall and finding out what they require. You will also need to pull a permit for the work. This step is necessary to help abide by local statutes and will benefit you in terms of taxes. Every town has different criteria when it comes to pool removal, and we’ll help guide you in the right direction to ensure all your bases are covered. The most costly is to completely remove all the materials and dispose of it. Some towns will require this. The more popular option is to crush the concrete/gunite and use it as fill. The most important step in removing a pool is to properly break up the bottom of the pool to allow the water table to rise and fall naturally. Pieces of debris are to be no bigger than about 12 in. x 12 in. in size for proper settling. If you have concrete or pavers surrounding the pool, that material can be used as fill. Once the concrete is broken up properly, we use about 15 tons of 3/4″ stone to settle in the larger voids. This will prevent settling. Once the stone is spread properly, The pool is either filled with clean fill or the property is regraded accordingly. During this process, the fill is compacted with a machine. We are so confident with our process we guaranty our work and have in the past put Patios directly on top of a pool we filled. We are proud to say we have not had any issues that we are aware of. We will always stand behind our work, we complete all projects with Screened topsoil and new lawn installation, unless customer requests otherwise. Your yard is now ready for seed, patio construction, deck, hardscaping, landscaping or whatever you’d like!